Taking an advantage of our in-house spinning, we offer a strategic advantage to our customers of better quality products at a shorter lead-time. Our product range includes fabrics like Single Jerseys Plain, Single Jerseys with Spandex / Lycra, Ribs with and without Spandex / Lycra, Interlocks, Piques (Single, Double, Honey Combs), 2 Thread / 3 Thread Fleece, Plaited & Variegated Structured fabrics, Feeder & Engineered stripe etc. in 100% cotton and various blends like poly/cotton, CVC, Viscose, Poly/Viscose, Cotton/lycra, Modal, Cotton/Modal, etc in Plain, Slub and Organic, Greige and Dyed Form. We specialize in supplying Body Size seamless fabrics for both underwear as well as Active Wear. These fabrics can be supplied in Single Jersey, Pique, Ribs and Interlock in various weight and width ranges. To cater to the growing demands of the top end apparel brands, we have been continuously adding on new special value added products with special finishes like Enzyme Washing / Bio Finishing, Anti-Microbial Finish. Our open width knitting machines, and open width finishing ranges are equipped with Mayer & Cie and Terrot knitting machines, Bianco slitter and squeezer, Bruckner 8 chamber stenter, and Lafer felt compactor, produce high quality open width knit fabrics as per the customers requirement. 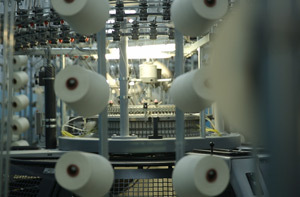 With our in-house state of the art yarn mill, we can control the quality of the yarn right from Raw-Material purchase up to yarn conditioning, to enable us to produce the highest quality level knit fabric. Mayer & Cie Circular Knitting single jersey (Open width/Tubular with all feeder lycra in 30”, 32”, 34” Diameters / 24 GG and 28 GG. Crock Meter James H. Heals & Co. Ltd.
High quality auto coned, spliced, SIRO cleaned, low twist yarn is used to get highest quality fabric. Foreign fiber contamination removing machines installed in Blow room of our yarn mill, to remove contamination, for producing high contamination controlled yarn. 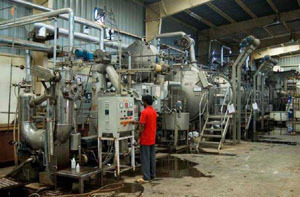 The company goes a step further by deploying workers for removing any contamination that may have escaped during the spinning process. 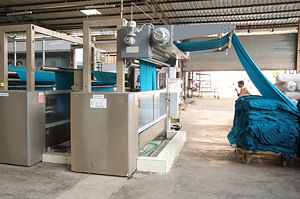 The dyeing and shrinkage properties have been perfected on machines from Switzerland, Italy, Germany and USA. Extra care is taken while matching colours, lot by lot on the Data Colour Computerized Colour Matching System (Spectraflash SF - 600 Plus CT), which is capable of matching colours in different media light. 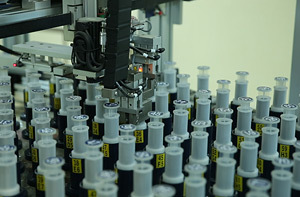 The lab dips are prepared on the Ahiba Nuance Spectra dye plus sample dyeing machines, which imitates the exact process parameters avoiding any chance of mismatch of shades. 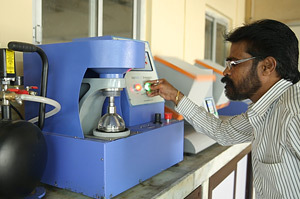 Equipped with all kind of latest testing machines for testing the quality parameters like shrinkage, gsm, spirality, pilling, ph level, color fastness, delta e values of finished fabrics to meet the requirements of our valued customers.